In 1970, upper-tier incomes accounted for 29% of US aggregate household income, while middle-tier incomes accounted for 62%. 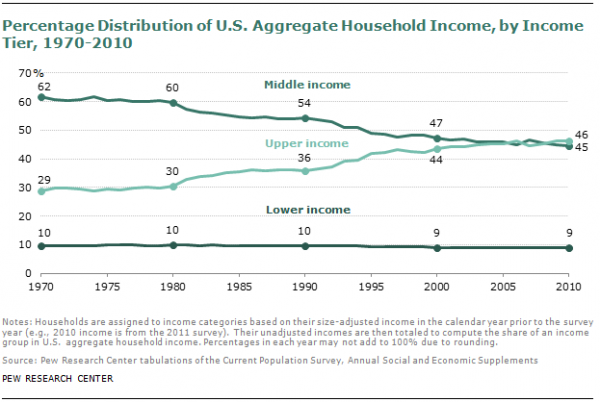 In 2010, upper-tier incomes accounted for 46% of US aggregate household income, surpassing middle-tier incomes at 45% for the first time since 1970. Only upper-income families have experienced notable gains in wealth from 1983 to 2010; the net worth of lower- and middle-income families is virtually unchanged.